The second company I’m going to profile for the Starters+Startups: The Future of SoLoMo & You panel I’m moderating is Wyst. The Wyst app allows you to share geo-tagged photographs, with family, friends and members of your Facebook and Twitter social networks. Share experiences. As they happen, where they happen. Discover new stories around you. It’s a new kind of message in a bottle. Since there was a video, I watched. It’s a 3:13 minute commercial, that I think does a really good job of telling you what Wyst’s all about, without a single line of dialogue. You simply follow this bloke around NY as he use the app and a companion screen of his iPhone shows you his Wyst thread. From what I gleaned from watching the video alone, you can take a picture, tag it with different emoticons and post it to your Wyst profile. I’ll know more when I take the app for a test-drive. The bottom of the page offers links to the App store, their social media profiles (Facebook and Twitter), the Latest News, Blog and About Us pages. You can also sign up for the Wyst newsletter on the page. 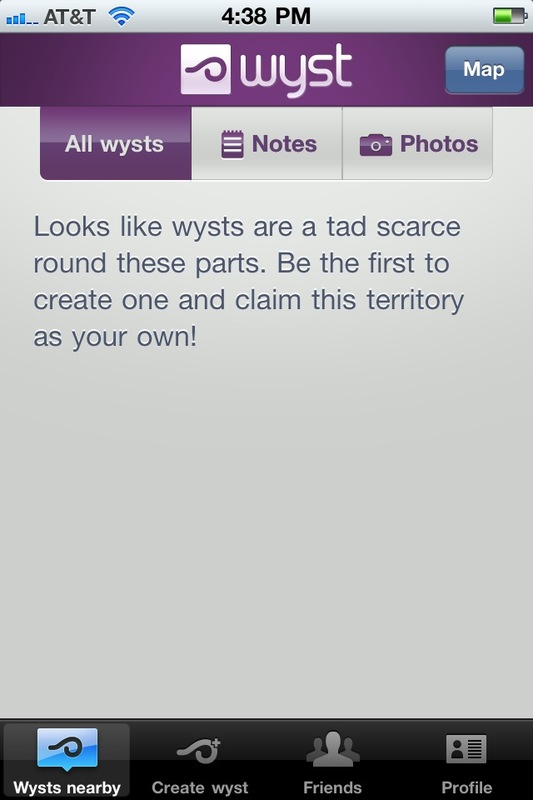 The Latest News includes the fact that Wyst is now out of Beta and available in the iTunes App store. The Blog takes you to a page which offers various Wysts of the Day. 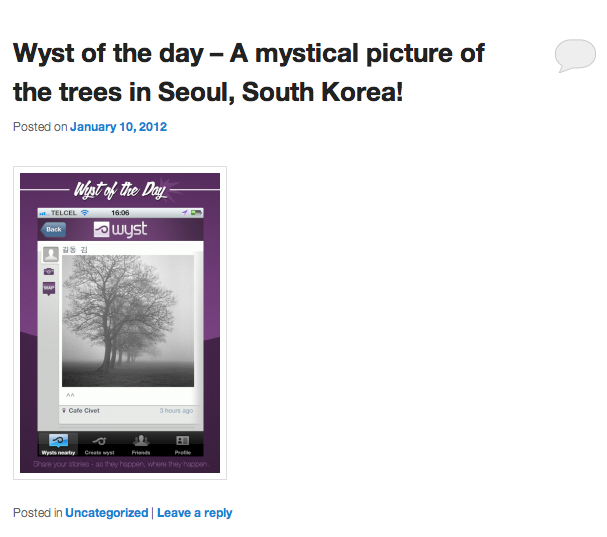 It’s essentially a blog roll of different pictures taken by Wyst users all over the globe. Wyst’s About Us page is fairly irreverent. As the Wyst site is light on pages, I checked out their Facebook and Twitter pages too (let’s get those numbers up fellas – okay?) while downloading the app from the App Store. Wysts are a tad scarce, huh? Gimme a chance why dontcha! I’m going to play around with their app this week too, so stay tuned for any updates. 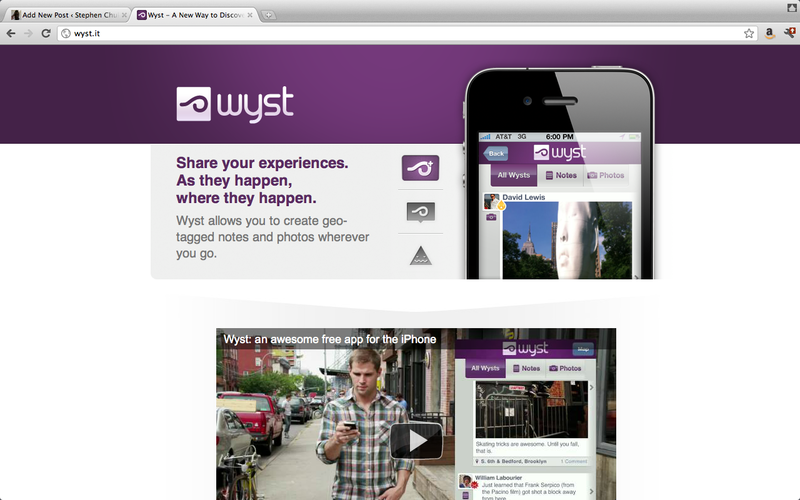 Again, if you’ve used Wyst, like it or have an opinion, please share!